Some posters noted that, traditionally, an upside-down American flag is a sign of distress or an act of political protest. WASHINGTON: White House press secretary Sean Spicer opened his daily press briefing with his American flag lapel pin upside down and the internet noticed. Spicer took the podium in the White House briefing room today and launched into a recap of President Donald Trump's first 50 days in office. Twitter lit up with jokes about the pin. Some posters noted that, traditionally, an upside-down American flag is a sign of distress or an act of political protest. Others tweeted that it was the logo for the television political series "House of Cards" and wondered if it was subtle advertising. 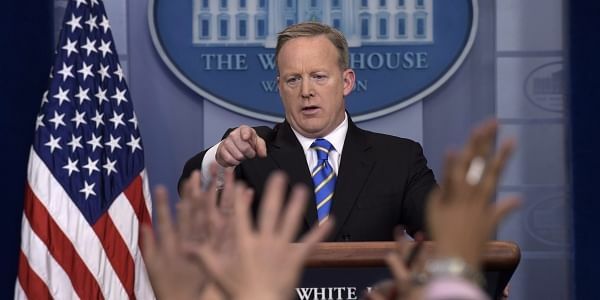 The situation was rectified when Spicer called on Fox News reporter John Roberts for the first question of the briefing. Roberts pointed out the pin, and Spicer fixed it.